Today is World Cardmaking Day and I manged to get a card done, woohooo! I've got a sick kitty that was just diagnosed as diabetic so we spent part of today at the vet getting meds and learning how to inject his insulin. Seems pretty easy and we're just thankful this is something to be treated! 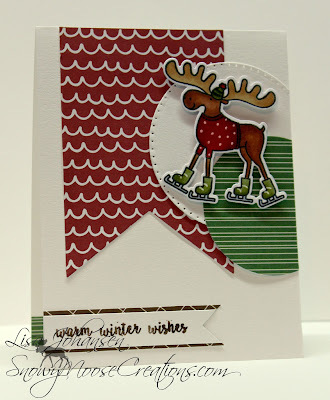 Anyway, back to my card.....I colored this moose from Avery Elle stamps in the other day for the Daily Marker 30 Day coloring challenge and used him to put this card together. The layout is from a previous Paper Players challenge. The current challenge at the Jingle Belles blog is to create cards for our friends and family that don't necessarily celebrate Christmas, so I went with a general winter theme. I used my white gel pen to add dots to the moose's sweater and laces to his skates. Want to see a really cool video of 2 bull moose in rut fighting? Go HERE. This was taken in Anchorage on Friday! Make sure you head over to the Jingle Belles blog, there is still time to play with their challenge! ♥MOOSING AROUND!♥ love it! love this suuuuuper-cute super-FAB card, as well! thanks for joining our holiday fun at JINGLE BELLES! Oh my word, what wonderful holiday fun ... your moose is fab ... so very glad you joined our Hanukkah Song at Jingle Belles.